Talk about your quick turn-arounds. What about a round of applause for those fine folks at Churchill Downs that have to wait until everyone leaves the grounds on Saturday night — a late one at that — and then have to get the facility and the grounds looking pristine for this Father’s Day program today. Claps. Claps. Claps. Here’s a look at today’s card, and a special thank you to all the “Dads” out there. 1st: 7-4-5-8-3-9…Babaknowsevrything (7) ran a well-beaten second last time out, but that was the first try ever on the dirt. Comes right back at this level and distance today, and should improve some off that effort. And, the winner of the last has already returned to win again, too. Nice work here on June 12 and the trainer hits with .17% of MC runners. Cape Time (4) goes for a barn having a really nice meet with limited number of runners. Drops radically for this one, and this barn hits with .40% of those making this plunge. Jockey from two back, when they ran third against much tougher, climbs back up. Gata Salvaje (5) is another dropping in class. This one gets blinkers for the first time, too. Both the drop and the glasses could help get this one more focused early on. Can’t totally dismiss after the nice work at the training center before the last run. Shows some class. I bet the 7 across the board and then box the top 3 in the exacta. 2nd: 2-3-6-4-7…My first “dot” of the day (must use for me) comes in this tilt with Baratti (2). Although this one has been made the 7-5 ML favorite, he has earned it with two straight impressive wins to start the 2018 year. The trainer just went out on his own this Spring after working for a top barn, and this one had a nice work at the Churchill Downs training center on June 3. Looks sharp still, and the best of this group. Red Corvette (3) has been racing against much tougher, but he has not been seen this year yet until today. Training sessions are OK for the return, but he does look good in previous runs while coming off a layup. Trainer has 3 wins in just 6 starts at this meet, and you can’t dismiss this barn at all. Calm Pacific (6) was bothered at the start of the last race, but still made his normal late run. Got up for third in that one, but gets more ground to help negotiate late in this one. Keep an eye on this guy. Could provide some later entertainment. I bet the 2 to win/place/show and then key the 2 over/under all the other numbers listed. 3rd: 2-9-3-1-8-7-4-6…I key on the top two numbers in this sequence. Wildwoodsgreatest (2) was claimed the last time out by a barn that hits with .23% of those making the debut with the new connections. This one is truly dropping off the claim, though, and the barn hits with .43% of those, and that is with 21 runners. Should love the move off the turf and back to the dirt, which this barn excels with, as well. Gets a huge rider switch for here. Adds up to a big performance here. Surprise Prize (9) is another one who gets a bit of class relief for this spot. Has hit the board in the last six and seven of the last eight races. Has a win in two tries here and a win at the distance. I can’t dismiss. I bet the 2 to win/place/show and then box with the 9 in the exacta. I key those two over the rest in a smaller version. 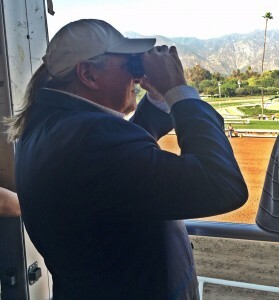 4th: 1-7-8-4-6-5-2-3…I will key my plays off the first three horses in this race, but mainly with the top 2, again. Locomotion (1) comes from the Bill Mott barn, and I am normally a little bit leery of those that he leaves behind here, since his main operation is in New York for the summer. But this one nearly won last time out in the slop and he has really run up against some tough customers in the past. The only bad race was three back at Gulfstream Park, when he had trouble leaving the gate that day and lost all chance early on. Looks like his works are solid and he picks up a top rider for this one. Air Strike (7) is a Street Sense colt that was odds-on favorite for the debut for the barn of Steve Asmussen. He rolled along late in that one, but ran out of ground. Now, he picks up an extra furlong, and experience, to boot. Watch out here. Could be a real good one. I bet the 1-7 across the board and then box those two solidly in the exacta. I key those 2 over the next four numbers in a smaller version. 5th: 8-2-9-5-4…My second “dot” of the day comes right here with Too Dim (8). Trained by Tom Amoss, and ridden by Corey Lanerie, this one ran away to an easy win here in the mud on May 17 against similar company. Comes right back this time, and I don’t see any reason why they can’t duplicate that performance again. This one is a Louisiana-bred, but he has brought his game with him to KY, and the trainer hits with .31% of claimers trying to repeat the win. I bet the 8 to win/place and then key the 8 over/under the numbers listed. 6th: 1-4-7-6-3-8…Sohni (1) comes into this one off a fourth place finish when she had loads of issues, including a 5-wide trip for much of the tilt. Before that, she had run two really nice races in a row and she caught a hot horse in each of the last two tries. Weneedtotalk (4) gets a little more class relief from her connections, and she could really relish this company today. Won on debut at Oaklawn Park back in February, but she has found that facing winners is a little bit tougher. Nice work at Keeneland on June 10. Maximus Beauty (7) has not raced this year, but goes for a trainer who hits with .16% of those returning off this type of layup. Works just seem OK, but the trainer drops this one into the claiming ranks for the first time and he hits with .21% of those doing that. Can’t dismiss. I bet the 1 to win/place/show and then box the top 3 numbers in the exacta. 7th: 1-2-5-4-3-8-6-7…I will focus my attention on the top 3 numbers in this list. Platinum Prince (1) hasn’t run since Jan. 1 at Gulfstream Park. Tired late in that one to finish fourth — but that was in Stakes company. Today, the 6YO gelding will be dropped into the claiming ranks for the first time and the trainer hits with .20% of those kind. He has 5 races over this course, with a second and two thirds, and he does have a nice 3-3-3 record in 17 starts at this specialty sprint distance. Looks to be training well for the return for a hot trainer all meet. Jockey has teamed up to win with 55% of the last 11 rides for this barn. Kissthatbabygoodby (2) will be close by to monitor the progress of the rail horse. Gets the meet’s leading rider back aboard after a one-race vacation, and this one ran fourth against Stakes company two races back, as well. Talented young trainer is having a solid meet here with .20% winners and has won 2 of 5 in the last two weeks. Watch out for this stalker/closer. Maniacal (5) is a horse that I have used often this year. He has a win, a second and a third in the last three starts. This will be the second start for the barn, which had him claimed two starts back. The switch back to turf should be fine with this guy, and the trainer hits with .44% of those returning after a win in the claiming ranks. I bet the 1-2 to win/place/show and then box the top 3 numbers in the exacta. 8th: 5-3-2-1-4-8…East Moon (5) gets to stretch out to two turns for the first time ever, and the trainer hits with .11% of those kind. But this one is a talented filly by Speightstown. She has two seconds and a third in the last three races, and has been working steadily for the first route experiment. Meet’s top rider gets back up for a barn that has a 8-4-3 record in just 24 starts this meet. Watch out here. Area (3) has been a favorite the las three races. Has two seconds and a third, but still looking for that elusive first win. New trainer takes his first shot today, though, and he hits with .19% of those, and with .26% of beaten favorites returning. Jockey has won with .31% of the last 78 mounts for this barn. Wow. Charreada (2) will be stretching out for the first time after a sprint debut for a top notch barn operation. Trainer hits with .24% of those going longer for the first time, and with .27% of those switching from a sprint to a route. Nice work at Keeneland on June 10. May offer some value to the play. I bet the 5-3 across the board and then box the top 3 in the exacta. 9th: 6-1-4-3-8-7-5…Wide open affair in today’s feature race, and I go with my Upset Special — Quick Quick Quick (6). This 3YO filly is a home bred for the Marylou Whitney Stables and is trained by my good friend Ian Wilkes. She had a fourth here on May 27, but that was her first run since last October. Had a little tardy start in that one, but finished up well. This one started her career with a second and a win at Saratoga last summer. And, this trainer normally takes his time with youngster. So, she has talent. She finds that kind of run again? At 6-1 odds? I like it. Maybe Wicked (1) broke the maiden for fun last time out when getting blinkers for the first time and trying the dirt for the first time. The combination may have worked wonders for this talented filly. Trainer hits with .30% of those trying winners for the first time, and this one continues to train well. Pray for Leslie (4) is another who broke her maiden last time out, but this one did it on her debut day. Daughter of Bernardini is very well bred, and goes for a trainer who has a 7-7-5 record in only 25 starts here this meet. Watch out here, too. I bet the 6 to win/place/show and then box the top 3 in the exacta. I key the 6 over/under all the numbers in two other smaller versions, as well. 10th: 4-10-1-5-7-8-9-6…Gris Gris (4) has hit the board in three straight, and won two back when on the turf. Gets back on the grass today, and should move right back into contention for another victory. Likes to stalk the pace and make a run late, and the regular rider is back in the saddle, too. Solid contender here. Blasted Boss (10) may be every bit as good as the top number, but has a tough post position for this one. She does like to close for this barn, and had a horrendous trip last time out. Maybe should have won that day, too. had a three race win streak snapped two starts back. Could return to the winner’s circle today, with a nice closing run. She’s a True Beauty (1) was claimed last time out by a trainer that wins with .21% of those returning for the first time for the new barn. This will be the third race off a layoff for this mare, too, and the new barn hits with .25% of those kind, as well. Solid works here for the new operation, especially on June 1. I bet the 4 to win/place/show and then box the top 3 numbers in one exacta. I key the top 3 over the rest in a smaller version.